In response to the lack of Taiwan studies in Indonesia, the Department of International Relations of Binus University, in collaboration with the Institute of International Relations (IIR) of National Chengchi University, Taiwan, organizes a series of workshops with the theme of “Cross-Strait Relations Interactions: Indonesia–Taiwan”. The workshops, supported by Chiang Ching-kuo Foundation for International Scholarly Exchange (CCKF), consist of six lectures and will be conducted from April to May 2016. The focus of the lectures will involve a variety of topics, such as politics, economics, security, transfer of technology, and people-to-people relations. The workshop also strives to develop an extensive academic discourse of Taiwan studies in Indonesia and ultimately increase mutual understanding between Indonesia and Taiwan. 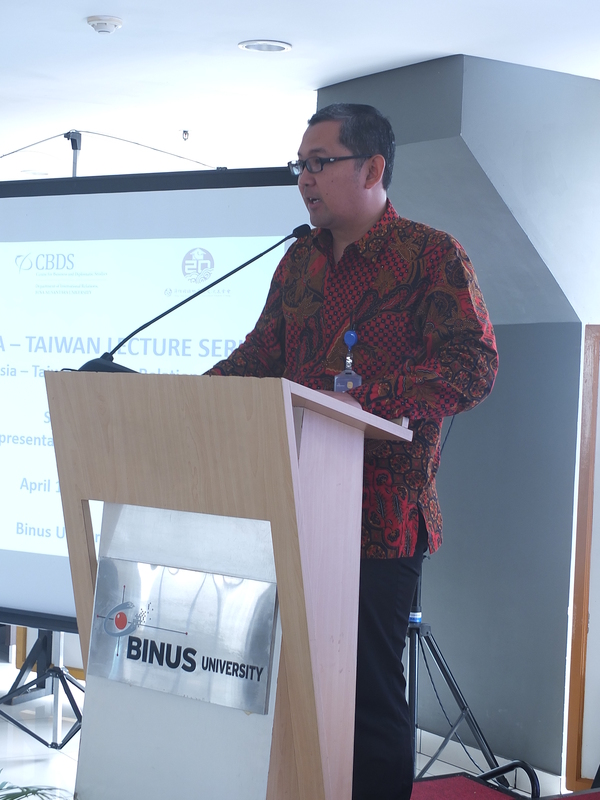 The first lecture of the workshops, going with the theme of “Indonesia–Taiwan Foreign Relations”, was held on Tuesday, 12 April 2016 at the exhibition hall of Anggrek Campus of Binus University. 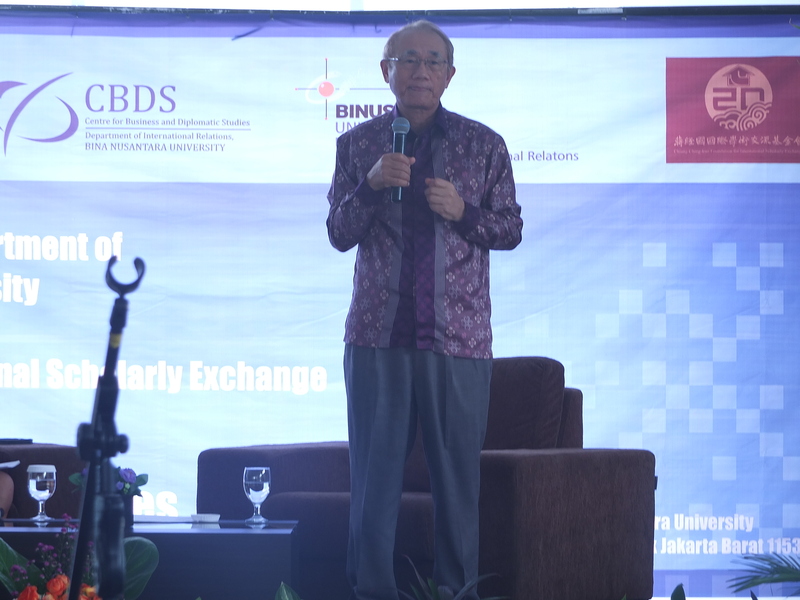 Several invited guests from the Investment Coordinating Board of the Republic of Indonesia (BKPM), the Ministry of Foreign Affairs, Indonesian Institute of Sciences (LIPI), and other institutions also came at this occasion. At the opening ceremony, the Department of International Relations of Binus University Prof. Tirta N. Mursitama stated that the workshops provide a great opportunity for the department as well as for Indonesia-based think-tanks for the academic discourses will hopefully contribute to strengthen and deepen Indonesia–Taiwan relations, not only in the economic, but also in socio-cultural aspect. The first lecture invited Representative Chang Liang-Jen from Taipei Economic and Trade Office (TETO) Jakarta as the speaker. 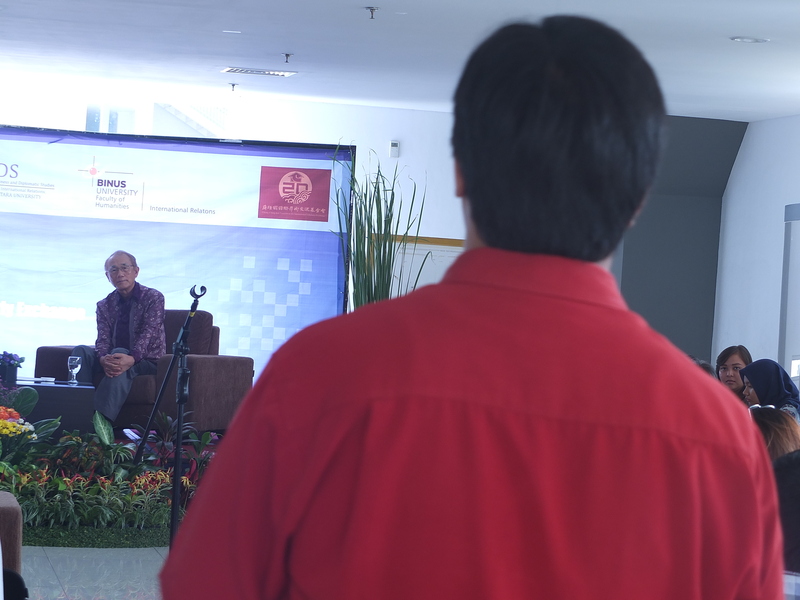 In his lecture, he described the dynamics of Indonesia–Taiwan relations comprehensively and admitted that there are still some rooms for improvement in the Indonesia–Taiwan relations. The participants’ enthusiasm was reflected from the questions raised following Representative Chang’s lecture. Alvin Ernesto, an International Relations student of Binus University, inquired about future relations between Indonesia and Taiwan after the recent presidential election in Taiwan. In response to the question, Mr. Tommy Lee from the Education Department of TETO answered that Indonesia and Taiwan have been maintaining good people-to-people relations. Thus, it is believed that the newly elected President of Taiwan will give extra attention to enhance the relations to bigger scope that will be mutually beneficial to both sides. An International Relations lecturer of Binus University, Pamungkas Ayudaning Dewanto, asked a question on the Taiwanese government’s policy in regards to the illegal migrant workers from Indonesia. Responding to the question, Ms. Kendra from TETO Public Affairs Department explained that the illegal status of many Indonesia migrant workers has been one of the Taiwanese government’s concerns. She said that “law enforcement and punishment to the people who hire illegal migrant worker” would be one of the solutions to the issue. As closing remarks, Representative Chang admitted he was hopeful of stronger and deeper relations between the two entities in the future. The next five lectures will be conducted on 12 May (with the theme of “People-to-People Relations”), 16 May (“Economic Relations”), 20 May (“Taiwan’s Soft Power Influence in South East Asia”), 25 May (“Security Relations”), and 26 May (“Technology Cooperation and Collaboration”). The lectures will invite prominent speakers from Taiwan whose expertise align with the topics and as an output a module on Indonesia–Taiwan relations will be published to the participant.